Wenfeng Ge has battled through adversity his whole life. Born with hearing and speech disabilities, the Chinese flyweight is completely deaf in his left ear and has partial hearing in his right ear, all of which hinders his speech. Even after winning a national title as an amateur Ge was told to retire from boxing because of his hearing issues. He went to work at a factory in Shanghai as a forklift truck driver but was unable to clearly take instructions in a busy workshop and he lost his job. His future looked bleak. In early 2015, coach Jiang of Suzhou Dingyuan Promotions, who is from the same city as Ge, invited him to join his team believing Ge’s destiny is to win a world title. Ge had to drop some weight and worked his way down from 140 pounds, eventually making his debut at 122 pounds in October 2015 with a six-round decision win. In his second fight he was matched against a tough Filipino and again won a decision. His journey continued over the next couple of years. He lost more weight, fighting four times in Thailand, winning all by KO and taking his record to 9-0. The Chinese fighter says being half deaf has affected his career but he isn’t letting it stop him from chasing his dreams. Wins over former IBF 112-pound boss Amnat Ruenroeng at junior bantamweight and tough Filipino Ivan Soriano at flyweight helped earn Ge a world ranking. It was a crucial win, not just for his career, but also his family. He hopes to take a step closer to a world title shot when he meets big-punching Giemel Magramo (22-1, 18 KOs) on Saturday, January 5 at the Suzhou Olympic sport center in the southeast China city of Suzhou. Magramo, 24, is riding a five fight win streak – all by KO – since dropping a close decision to Muhammad Waseem in 2016. Ge, 31, who is rated No. 9 by The Ring at 112 pounds, has prepared under the watchful eye of former WBA strawweight titlist Joma Gamboa. He expects a tough fight against his opponent. Currently Magramo is ranked WBC, WBA and IBF (No. 9) and WBO (No. 7), while Ge sits at IBF (No. 12) and WBO (No. 10). Zhang has already tried to match Ge in a world title but has so far been unsuccessful. 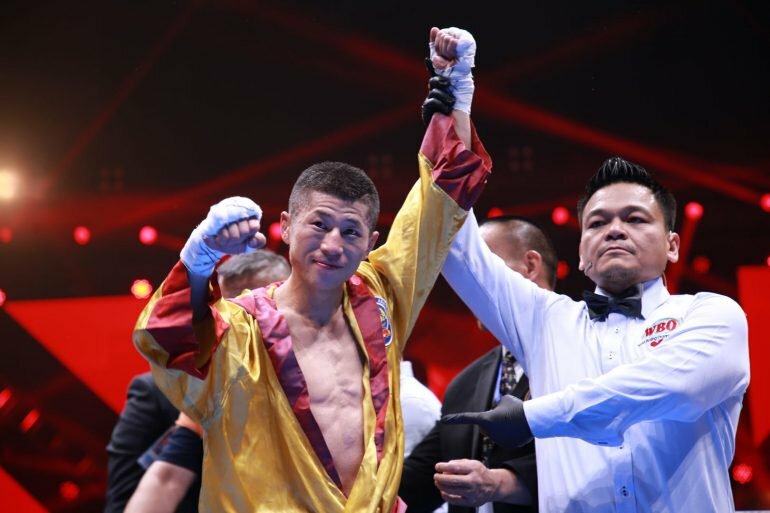 “I have tried to talk to the manager of Sho Kimura immediately after Wenfeng beat Amnat Ruenrong, but we could not reach an agreement because Kimura had an option signed with another Chinese promoter before his fight against Zou Shiming,” explained Zhang. “And then after Kosei Tanaka won against Kimura, I tried to talk to the team of Tanaka about the fight between Tanaka and Wenfeng in China, but I was refused again. Questions and/or comments can be sent to Anson at elraincoat@live.co.uk and you can follow him on Twitter: @AnsonWainwright.